ARTL replied, "Maria, we're praying that you will publish Brian Rohrbough's submission. Regarding refreshing readers' memories [you could] publish a link in the preface which the readers can use to review Clarke's online article. Of course, the Forsythe piece could have told readers where to find our original letter online, but they were not told, so right now the readers' opportunity to be informed of both sides of the current personhood debate is slanted. Please consider publishing both sides. Pro-life activity in Colorado has exploded onto the scene, with far more energy and effort expended in the last year [with the personhood strategy] as compared to the previous 17 years (since rescue ended)." Clarke Forsythe, president of Americans United for Life, wrote a Fall 2007 Human Life Review article, A Lack of Prudence, criticizing leaders he never named for an argument he never described. As the president of American Right To Life, I urge Christians who believe we are in error to address our arguments head on. We condemn the fifteen-year partial birth abortion fiasco because while it excelled as a fundraiser generating a quarter of a billion dollars, it never had the authority to prevent even one abortion. ● end with the legal meaning, "and then you can kill the baby." Law is authority. Regulation is authority. Supreme Court rulings exercise authority. Only being able to save one of three children in a burning building is tragic but refraining is inexcusable. Opportunistic rescue is a moral imperative and does not authorize the killing of the innocent. But worse than saving none would be passing a law that acknowledges a right to burn alive one child to save every other in the world. As Ambassador Alan Keyes says, "That's the devil's game; he'd be happy to ban every abortion if we'd all agree to just one." While Forsythe only identified us as "certain anti-abortion activists," HLR readers should know that the signers of the full-page open letters critical of the PBA ban included the heads of Human Life International, Operation Rescue National, American Life League, and the oldest "Right To Life" group in the country, Colorado RTL. Leaving the organizations unnamed made it easy to make the claim throughout the article that the critics "misunderstand" the legislative process and the courts. Those recognizing the evil of the so-called PBA ban continue to pick up strong allies including Washington D.C. March for Life organizer Nellie Grey; James Odom, Focus on the Family staff attorney who left Dr. James Dobson's organization largely due to this controversy; and Judge Roy Moore, former Chief Justice of the Alabama Supreme Court, whom we added to our later full-page ads as one of the many credentialed leaders condemning the Gonzales v. Carhart PBA ruling. Mr. Forsythe sidesteps our principled arguments and corroborating evidence by claiming that we all simply misunderstand the PBA ban, the process, the ruling, etc. He should be able to admit that, after decades of regulating child killing, strong disagreement is growing within the pro-life movement. We don't misunderstand; we disagree, vehemently. After seeing our ad in his newspaper, even the nation's leading ban supporter, Dr. Dobson, admitted in his May 2007 newsletter available online that, "Ending partial-birth abortion... does not save a single human life." Of course it doesn't and in the two years since the ruling, the abortion industry brought no "as applied" challenges to the ban, but compromised organizations including Michigan Right To Life, refusing to let their fund-raising bonanza die, continue to tilt at PBA windmills. 1) The abortionist may partially deliver the unborn child all the way to the bellybutton, but not "past the navel"
2) Then "a leg might be ripped off," etc. to "kill the fetus"
3) Or alternatively, "find... less shocking methods to abort"
concur optimistically on page 30 that, "The medical profession [abortionists] may find different and less shocking methods to abort the fetus..." The Justices... upheld a mere "regulatory" law "under the Commerce Clause" (p. 36). These Justices misrepresented as "pro-life" actually suggest other ways for abortionists to kill the fully intact, late-term child to comply with their regulation, such as "an injection that kills the fetus" (p. 34). Imagine the horror yet to come now that our greatest Christian leaders are willing to call good evil, and evil good. Throughout the ruling, Justices Kennedy, Roberts, Scalia, Thomas, and Alito concur that both the partial-birth abortion (PBA) ban, and their ruling, allow the abortionist to deliver a late-term baby all the way up to the navel and then kill him (especially pp. 17-26). To actually violate this regulation "requires the fetus to be delivered 'until... any part of the fetal trunk past the navel is outside the body of the mother'" (p. 17)." The growing list of those condemning the PBA fiasco contains many qualified observers but even if it did not, no Christian needs a law degree to know that a ruling is wicked if it allows, for whatever fallacious justification, the execution of a Jew for being Jewish, or a black man to be owned, or a baby to be pulled out to the bellybutton and killed. Gonzales v. Carhart is not a pro-life ruling but is brutally wicked on its face. Forsythe claims the PBA Ban Act and ruling were beneficial because they "served several purposes," and he lists five, three of which were publicity for the pro-life cause, one was circular (Gonzales overturned Stenberg which had struck down PBA bans) and one was a brand new legal justification: the PBA ban "served as a legal fence between abortion and infanticide." This is an after-the-fact stretch to find a legal justification for a misguided effort. Further, there is no fence, just a swinging gate, since the PBA ban does not even attempt to prohibit killing a child. The next fundraising cycle, opposition to FOCA, the Freedom of Choice Act, demonstrates the pro-life industry's swinging gate model. The industry's strategy of regulating child killing only builds gates; personhood alone builds a fence. Forsythe's remaining three claims were that the PBA BAN was justified for the publicity it garnered: that it "brought national public attention," "showed the cruelty," and "helped the public better understand..." These do not justify the immorality of regulating child killing. And these claims were further undermined by the proclaimed "victory" that didn't save even one child but misled a nation into believing that this wicked court was pro-life. 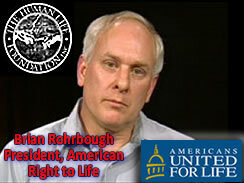 In 1999 my son Daniel Rohrbough was murdered at Columbine High School along with twelve other people. The Columbine murderers thought publicity justified their actions and in the aftermath many others, driven by their agendas, actually tried to rationalize the wrongdoing claiming it could bring about "gun control" or some other great good, like raising money for their cause. We must start acknowledging that every unborn child is a person with the God-given right to life, a right that we have no authority to bargain with. When the Gonzales ruling came down I was president of Colorado RTL. Our widely-read ruling analysis is still available online at ColoradoRTL.org. Some activists then claimed this was a good ruling, "because the abortionists complained." But Planned Parenthood did not appreciate the mavericks who caused them such difficulty by performing partial-birth abortions. And while the abortion industry makes an obligatory stand against any "pro-life" effort, they probably laugh that the PBA ban did their heavy lifting and cleaned up their greatest, and perhaps fatal, public relations nightmare. We did not need the Supreme Court to uphold a modified partial-birth abortion, which is what they did, in order to expose the wickedness of child killing. And worse, now we have Christian leaders using technicalities to defend and dismiss the brutality of the PBA ruling, further muddying the public's conscience. Incrementalism is fine; compromised incrementalism violates God's enduring command, Do not murder. When you compromise on this fundamental law, you undermine the pro-life goal of re-establishing the personhood of the child, and you cannot possibly foresee all the negative consequences. And now these kids will suffer more horrifically with this ruling than before, as we congratulate ourselves. Dr. Dobson, in celebrating this evil ruling, you used the word "brutally" regarding PBA. The ruling itself speaks of brutality, but in the opposite sense that you used it. The Justices raise the likelihood that with this ruling, the fetus faces greater brutality. On page 30, the Justices note the objection "that the standard D&E is in some respects as brutal, if not more, than the intact D&E [PBA]." That is, standard late-term D&E abortion appears to be more cruel than PBA. And the Justices do not rebut that claim. Their interest is not to protect children, but to promote the "integrity and ethics" (p. 27) of late-term abortion. The concern of these "pro-life Justices" has nothing to do with the brutality against the child, but with improving "the public's perception" (p. 30) of late-term abortion. Americans United for Life, Focus on the Family, and the National RTL Committee spent fifteen years leading an effort to regulate child killing that ensured that late-term abortions are more painful to children and less visible to the public, hiding the victim, and improving the image of her murderer. The U.S. Supreme Court never reversed their wicked Dred Scott decision, and it is unknown how "legalized" child killing will eventually be ended in America. While the personhood wing advances, teaching the public and governing officials about the God-given right to life of the unborn, the child-killing regulators try to undermine every personhood effort as though victory will come only as more judges agree to violate the most fundamental principle of government. Perhaps the road to abolition will go through the "borking" of a dozen judges who know right from wrong. Apart from the Second Coming of Jesus Christ, American RTL claims it irrefutable that, if pro-life leaders cling more tightly to power and influence than to morality and justice, their own actions will postpone the eventual protection of the innocent. ● "The medical profession... may find different and less shocking methods to abort the fetus (p. 30)"
● The ruling affirms causing "'the fetus to tear apart' (p. 4)"
● "If a living fetus is delivered past the critical point [the bellybutton] by accident or inadvertence [and then killed] no crime has occurred (p. 18)"
And Americans United for Life applauds the court. We rebuke them. This is a brutally wicked ruling. Then in an extraordinary attempt to wash the hands of judges on the very court that "legalized" murdering the innocent nationwide, Forsythe writes "the justices... do not 'rule' that abortions unprohibited by the statute 'are legal.'" Startling. Clarke Forsythe is denying their palpable guilt, and eggregiously defending the very court and the judges who mislead governing officials to believe that they must permit child killing. Forsythe then proves that legal positivism (which is moral relativism in law) prevails at AUL, when he wrote that, "the critics impugn Justices Thomas and Scalia for their established position that abortion is a matter to be decided by the people at the state level because the Constitution contains no right to abortion." No constitution or other side-deal among men has the authority to set aside God's enduring command, Do not murder. No state nor any subdivision of government has the authority to de-criminalize gassing Jews, lynching blacks, or killing children. We note however that the Constitution does require that the states provide equal protection of the law to all persons. Googling these quotes will corroborate that in 2002 Scalia said, "I will... strike down a law that is the opposite of Roe v. Wade. ... One wants no state to be able to prohibit abortion and the other one wants every state to have to prohibit abortion, and they're both wrong..." In 2006 Scalia claimed, "Take the abortion issue... there's something to be said for both sides." And on April 7, 2008 Scalia said, "You want the right to abortion? Create it the way most rights are created in a democracy. Persuade your fellow citizens it's a good idea - and pass a law." In September 2008 Scalia told CBS News' 60 Minutes that, "anti-abortion people... say that the Equal Protection Clause requires that you treat a helpless human being that's still in the womb the way you treat other human beings. I think that's wrong." Clarence Thomas is just as bad. "National Right to Life has misled the pro-life community to think that this is the wrong time to advocate personhood because we need one more Justice on the Supreme Court to have a pro-life majority," said Rohrbough. "But if we added a Justice who would uphold the right to life of the unborn, then we would have only one such Justice. The failed long-term strategy of regulating the killing of a fetus has left America without a single Justice who knows that it's wrong to kill an unborn baby; National RTL's compromise will never produce a pro-life Supreme Court." In an article about NRTL's failed PBA ban, Notre Dame Law School's professor emeritus Charles Rice wrote, "Every justice now on the court accepts the Roe holding that the unborn child is a non-person... The situation remains as described by Justice John Paul Stevens in Planned Parenthood v. Casey." For Stevens had written that, "the Court... rejected, the argument 'that the fetus is a "person"'. ... there was no dissent..." And Clarence Thomas wrote in his Stenberg dissent that "a State may permit abortion," and Antonin Scalia wrote in Casey, "The states may, if they wish, permit abortion-on-demand..."
According to the group's website, AmericanRTL.org, "To make their strategy appear successful, National RTL has misled the pro-life movement into believing that abortion accomplices like Samuel Alito, John Roberts, Thomas and Scalia are pro-life." "National RTL claims success in Antonin Scalia but he is not pro-life; like all the Republicans on the Court, he is a legal positivist," Rohrbough said. "Like their Dred Scott counterpart that ruled a black man could be owned as property, the current Republican Supreme Court is wicked and will only learn about the right to life of the unborn from the advancing personhood wing of the pro-life movement." Yes, we criticize our Supreme Court justices. We urge them to repent. However, other than the personhood wing of the pro-life movement, no one is teaching our judges of the unalienable right to life of the unborn, which Americans United for Life have relegated to a second-tier negotiable issue. So we pray that Clarke Forsythe and the readers of Human Life Review will focus on the strategy of the pro-life movement and realize that regulating child killing, because it is immoral, merely prunes the abortion weed while strengthening its root.